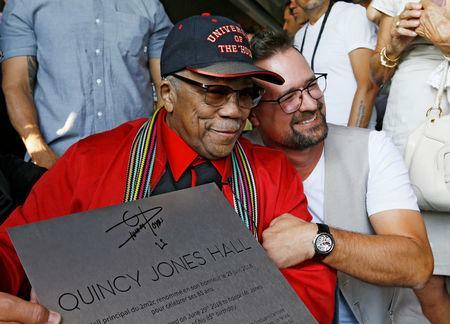 MONTREUX, Switzerland (Reuters) - An all-star cast of musicians from Ibrahim Maalouf to Mos Def, Robert Glasper and Monty Alexander celebrated producer Quincy Jones at an epic Montreux concert that ended just before dawn on Monday. Jones, who turned 85 in March, attended the birthday tribute in the House of Jazz at the 52nd edition of the Montreux Jazz Festival, where he served as co-director in the 1990s. Drummer Nate Smith and Kinfolk opened the three-hour show at 02:00 am with "Skip Step", later joined by Richard Bona on bass. "There was no sound check, it's all about improvisation," Smith told the audience of 600 at the free event, to be available on Qwest TV, Jones' video-streaming service, in September. Lebanese-born Maalouf, wearing a green camouflage cap, took centre stage to play a solo Bach prelude on his trumpet. Cuban pianist and composer Alfredo Rodriguez, a protege of Jones, and Bona, sporting a white turban and dark glasses, joined Maalouf for the track "Ay, Mama Ines". Femi Koleoso of Ezra Collective thanked Jones, a 27-time Grammy award winner, for "making us dance for generations" as Briton Jorja Smith, 21, sang "On My Mind". Another British newcomer and Jones prodigy, Jacob Collier, 23-year-old singer and pianist, performed "Human Nature" from Michael Jackson's best-selling "Thriller" album, produced by Jones in 1982. Four dancers accompanied the piece. Jamaican-born Monty Alexander, 74, joined in "Happy Birthday" and played his countryman Bob Marley's "Redemption Song". Brooklyn rappers Talib Kweli and Yasiin Bey, best known by his stage name Mos Def, hooked up with Glasper on keys and Christian Scott on trumpet for a hip hop jam. Nik West played "Kiss" and other hits by the late Prince, another Montreux legend, to round off the show.